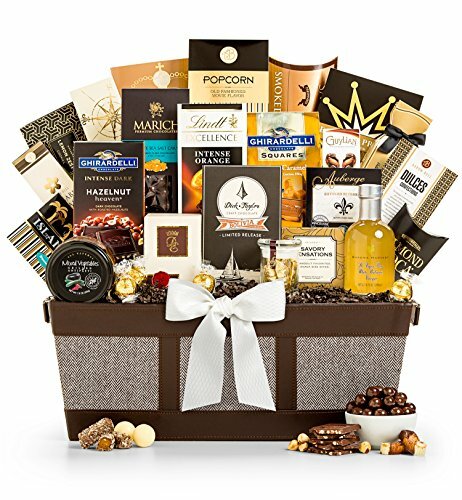 Fit for Royalty Gourmet Gift Basket is a plentiful gift of luxury chocolate, wild Pacific smoked salmon and many more gourmet delights is fit for any king or queen. A curated collection of our favorite chocolates and gourmet fare comes together in this stately herringbone and leather-trimmed serving tray, presenting a generous gift that's perfect for any occasion. Included in this gourmet gift basket: 72% Belize Toledo Chocolate, Auberge Brie Cheese, Chocolate Fruit, Chocolate Sea Salt Caramels, Ghirardelli Hazelnut Heaven Intense Dark Chocolate, Gourmet Arabica Coffee, Guylian Artisanal Belgian Chocolates, Lindt Caramel Truffles, Milk Chocolate Malt Balls, Pecan Nougat Caramels, Sonoma Harvest d'Anjou Pear Balsamic Vinegar, Wasabi Peas, Almond Roca, Caramel Popcorn with Chocolate Drizzle, Chocolate Pomegranate Cream Truffles, Fresh Roasted Almonds, Ghirardelli Milk Chocolate with Caramel Squares, Gourmet Mini Pretzels, Lemon Tea Cookies, Lindt Dark Chocolate Orange Bar, Mixed Vegetables Grilled Antipasti, Smoked Salmon, Tropical Island Mix and White Cheddar Gourmet Popcorn. Each gourmet item is carefully assembled, and the gift is accentuated with a hand-tied satin ribbon with optional personalization. A free card is included with your personal message or greeting, as well as complimentary scissors so your recipient can easily open their gift. Your gift will leave a lasting impression as they continue to enjoy this large herringbone serving tray with leather trim and dual handles, perfect for repurposing in the home or office. This plentiful gift of luxury chocolate, wild Pacific smoked salmon and many more gourmet delights is fit for any king or queen. Sonoma Harvest Pear Balsamic, Mixed Vegetables Antipasti, French Brie.